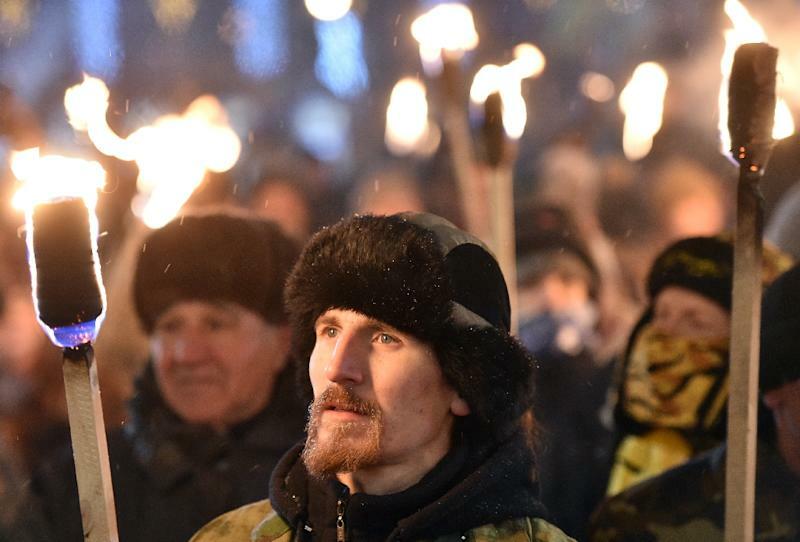 Kiev (AFP) - The change could hardly have been more confrontational or symbolic. Ukraine's capital Kiev on Thursday renamed its Soviet-era Moscow Avenue after a Russian hate figure accused by the Kremlin of siding with the Nazis during World War II. 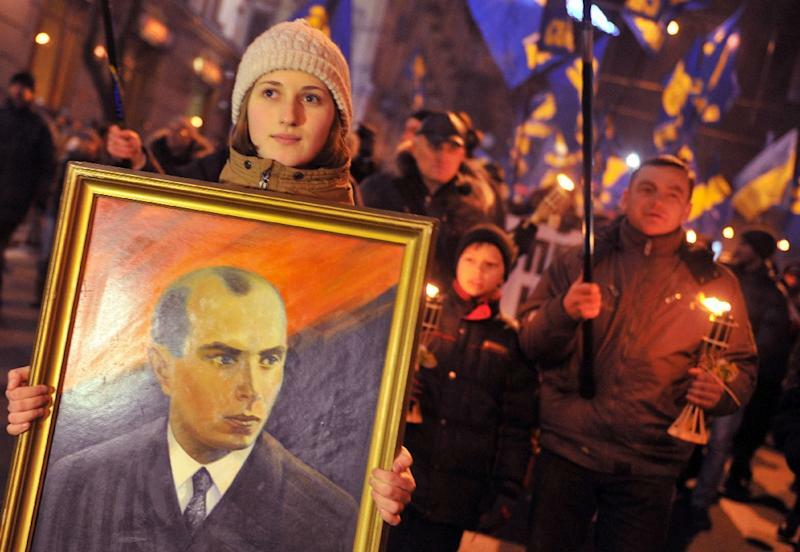 Kiev's local council decided that one of the bustling city's main northern arteries will now honour Ukrainian nationalist Stepan Bandera. The decision is in line with the push against totalitarian regimes such as the Communist Party that Ukraine launched after the February 2014 ouster of its Russian-backed leader and the decision by the new leaders to anchor the country's ties to the West. Dozens of Lenin monuments have since fallen as authorities take out their outrage against a lifetime of Soviet rule. But Bandera is an especially controversial figure with a strongly disputed past whose honouring by Kiev may outrage Moscow further still. "The fact that Moscow Avenue was renamed in honour of a nationalist -- there is much more politics here than common sense," Russian parliament member Kazbek Taysayev told Moscow's RIA Novosti state news agency. "And this is a fascist policy that the fascist authorities in Kiev are leading in Ukraine." Bandera was detained and handed the death sentence by Warsaw in the 1930s for fighting Poles who occupied a predominantly nationalist western part of Ukraine after World War I. The sentence was later reduced to life in prison -- a punishment that became meaningless once the Nazis invaded Poland and established their own rule over the east European state in 1939. Bandera escaped into neighbouring western Ukraine and soon became the head of the radical wing of the Organisation of Ukranian Nationalists (OUN). Moscow accuses Bandera and his OUN fighters of siding with the Nazis once they invaded the Soviet Union in 1941. Bandera declared independence days after the Nazis moved into Ukraine -- a decision that proved nearly fatal because the German Gestapo almost immediately detained him and put him in a concentration camp. He was released once it became clear that the Nazi were going to lose World War II. Bandera continued to lead his OUN forces against the Soviets from self-imposed exile in what was then Western Germany until 1959 -- the year he was finally shot dead with a poisoned bullet by a KGB agent in Munich. The complex figure is an icon for Ukrainian nationalists who is widely reviled by Russia and viewed with great scepticism by Israel. But Ukrainian parliament member Oleksandr Brygynets said Bandera Avenue marked only the start of a wholesale change in Kiev. "Dear friends, Bandera Avenue is a good thing, but it is not enough," Brygynets wrote on Facebook. "We also need an airport named after Ivan Mazepa." Mazepa was an ethnic Ukrainian who fought alongside Sweden in its losing 1709 war with Russia and is also demonised by Moscow.